Watch the webcasts from the Bay of Santa Maria in Mexico, San Francisco Bay, Fraser River Delta near Vancouver, Canada and the Copper River Delta in Alaska. CLICK HERE for classroom-tested lesson plans from the U.S. 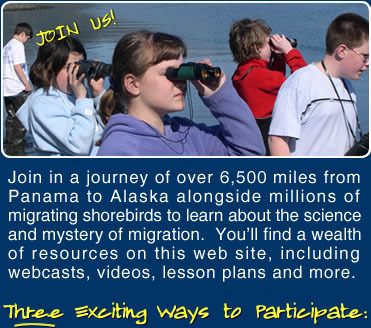 Fish and Wildlife Service about habitat, shorebirds, migration, and more. Check us out on on YouTube, Facebook, and Twitter!